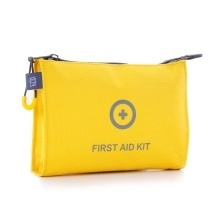 This first aid kit bag is very useful for outdoor sports, traveling and home use. Polyester storage bag for durability. Interior pockets keep all accessories in order. 9 kinds of first aid supplies to meet different needs. Compact and lightweight, convenient to carry. Great for traveling, outdoor sports, home, car, emergency, etc.